"Atacama" redirects here. For other uses, see Atacama (disambiguation). Map of the Atacama Desert: The area most commonly defined as Atacama is yellow. In orange are the outlying arid areas of the southern Chala, Altiplano, Puna de Atacama, and Norte Chico. According to the World Wide Fund for Nature, the Atacama Desert ecoregion occupies a continuous strip for nearly 1,600 km along the narrow coast of the northern third of Chile, from near Arica (18°24'S) southward to near La Serena (29°55'S). 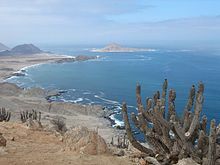 The National Geographic Society considers the coastal area of southern Peru to be part of the Atacama Desert and also includes the deserts south of the Ica Region in Peru. Peru borders it on the north and the Chilean Matorral ecoregion borders it on the south. To the east lies the less arid Central Andean dry puna ecoregion. The drier portion of this ecoregion is located south of the Loa River between the parallel Sierra Vicuña Mackenna and Cordillera Domeyko. To the north of the Loa lies the Pampa del Tamarugal. The Coastal Cliff of northern Chile west of the Chilean Coast Range is the main topographical feature of the coast. The geomorphology of the Atacama Desert has been characterized as a low-relief bench "similar to a giant uplifted terrace" by Armijo and co-workers. The intermediate depression (or Central Valley) forms a series of endorheic basins in much of Atacama Desert south of latitude 19°30'S. North of this latitude, the intermediate depression drains into the Pacific Ocean. Although the almost total lack of precipitation is the most prominent characteristic of the Atacama Desert, exceptions may occur. In July 2011, an extreme Antarctic cold front broke through the rain shadow, bringing 80 cm (31 in) of snow to the plateau, stranding residents across the region, particularly in Bolivia, where many drivers became stuck in snow drifts and emergency crews became overtaxed with a large number of rescue calls. In 2012, the altiplano winter brought floods to San Pedro de Atacama. On 25 March 2015, heavy rainfall affected the southern part of the Atacama Desert. Resulting floods triggered mudflows that affected the cities of Copiapo, Tierra Amarilla, Chanaral, and Diego de Almagro, causing the deaths of more than 100 people. The Atacama Desert is commonly known as the driest nonpolar place in the world, especially the surroundings of the abandoned Yungay town (in Antofagasta Region, Chile). The average rainfall is about 15 mm (0.6 in) per year, although some locations, such as Arica and Iquique, receive 1 to 3 mm (0.04 to 0.12 in) in a year. Moreover, some weather stations in the Atacama have never received rain. Periods up to four years have been registered with no rainfall in the central sector, delimited by the cities of Antofagasta, Calama, and Copiapó, in Chile. 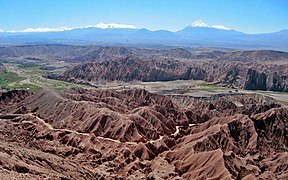 Evidence suggests that the Atacama may not have had any significant rainfall from 1570 to 1971. The Atacama Desert may be the oldest desert on earth, and has experienced extreme hyperaridity for at least 3 million years, making it the oldest continuously arid region on earth. The long history of aridity raises the possibility that supergene mineralisation, under the appropriate conditions, can form in arid environments, instead of requiring humid conditions. 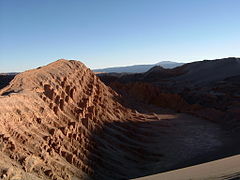 The presence of evaporite formations suggest that in some sections of the Atacama Desert, arid conditions have persisted for the last 200 million years (since the Triassic). The Atacama is so arid that many mountains higher than 6,000 m (20,000 ft) are completely free of glaciers. Only the highest peaks (such as Ojos del Salado, Monte Pissis, and Llullaillaco) have some permanent snow coverage. The southern part of the desert, between 25 and 27°S, may have been glacier-free throughout the Quaternary (including during glaciations), though permafrost extends down to an altitude of 4,400 m (14,400 ft) and is continuous above 5,600 m (18,400 ft). Studies by a group of British scientists have suggested that some river beds have been dry for 120,000 years. However, some locations in the Atacama receive a marine fog known locally as the camanchaca, providing sufficient moisture for hypolithic algae, lichens, and even some cacti—the genus Copiapoa is notable among these. Geographically, the aridity of the Atacama is explained by it being situated between two mountain chains (the Andes and the Chilean Coast Range) of sufficient height to prevent moisture advection from either the Pacific or the Atlantic Oceans, a two-sided rain shadow. The lack of humidity, rain, and light pollution together produce a dusty, rocky landscape. In a region about 100 km (60 mi) south of Antofagasta, which averages 3,000 m (10,000 ft) in elevation, the soil has been compared to that of Mars. Owing to its otherworldly appearance, the Atacama has been used as a location for filming Mars scenes, most notably in the television series Space Odyssey: Voyage to the Planets. In 2003, a team of researchers published a report in which they duplicated the tests used by the Viking 1 and Viking 2 Mars landers to detect life, and were unable to detect any signs in Atacama Desert soil in the region of Yungay. The region may be unique on Earth in this regard, and is being used by NASA to test instruments for future Mars missions. The team duplicated the Viking tests in Mars-like Earth environments and found that they missed present signs of life in soil samples from Antarctic dry valleys, the Atacama Desert of Chile and Peru, and other locales. However, in 2014, a new hyperarid site was reported, María Elena South, which was much drier than Yungay, and thus, a better Mars-like environment. Towards Atacama, near the deserted coast, you see a land without men, where there is not a bird, not a beast, nor a tree, nor any vegetation. In 2008, the Phoenix Mars Lander detected perchlorates on the surface of Mars at the same site where water was first discovered. Perchlorates are also found in the Atacama and associated nitrate deposits have contained organics, leading to speculation that signs of life on Mars are not incompatible with perchlorates. The Atacama is also a testing site for the NASA-funded Earth–Mars Cave Detection Program. In spite of the geographic and climatic conditions of the desert, a rich variety of flora has evolved there. Over 500 species have been gathered within the border of this desert. These species are characterized by their extraordinary ability to adapt to this extreme environment. Most common species are the herbs and flowers such as thyme, llareta, and saltgrass (Distichlis spicata), and where humidity is sufficient, trees such as the chañar (Geoffroea decorticans), the pimiento tree, and the leafy algarrobo (Prosopis chilensis). The llareta is one of the highest-growing wood species in the world. It is found at altitudes between 3,000 and 5,000 m (9,800 and 16,400 ft). Its dense form is similar to a pillow some 3 to 4 m (9.8 to 13.1 ft) thick. It concentrates and retains the heat from the day to cope with low evening temperatures. The growth rate of the llareta has been recently estimated at about 1.5 cm per year, making many llaretas over 3,000 years old. It produces a much-prized resin, which the mining industry once harvested indiscriminately as fuel, making this plant endangered. The desert is also home to cacti, succulents, and other plants that thrive in a dry climate. Cactus species here include the candelabro (Browningia candelaris) and cardon (Echinopsis atacamensis), which can reach a height of 7 m (23 ft) and a diameter of 70 cm (28 in). 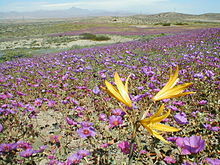 The Atacama Desert flowering (Spanish: desierto florido) can be seen from September to November in years with sufficient precipitation, as happened in 2015. The climate of the Atacama Desert limits the number of animals living permanently in this extreme ecosystem. Some parts of the desert are so arid, no plant or animal life can survive. Outside of these extreme areas, sand-colored grasshoppers blend with pebbles on the desert floor, and beetles and their larvae provide a valuable food source in the lomas (hills). Desert wasps and butterflies can be found during the warm and humid season, especially on the lomas. Red scorpions also live in the desert. A unique environment is provided by some lomas, where the fog from the ocean provides enough moisture for seasonal plants and a few animal species. Surprisingly few reptile species inhabit the desert and even fewer amphibian species. Chaunus atacamensis, the Vallenar toad or Atacama toad, lives on the lomas, where it lays eggs in permanent ponds or streams. 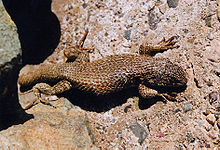 Iguanas and lava lizards inhabit parts of the desert, while salt flat lizards, Liolaemus, live in the dry areas bordering the ocean. One species, Liolaemus fabiani, is endemic to the Salar de Atacama, the Atacama salt flat. Birds are probably the largest animal group in the Atacama. Humboldt penguins live year-round along the coast, nesting in desert cliffs overlooking the ocean. 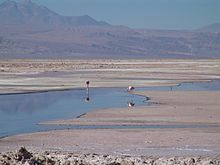 On salt flats both near the Pacific and inland, Andean flamingos flock to eat algae. Other birds (including species of hummingbirds and sparrows) visit the lomas seasonally to feed on insects, nectar, seeds, and flowers. The lomas help sustain several threatened species, such as the endangered Chilean woodstar. Because of the desert's extreme aridity, only a few specially adapted mammal species live in the Atacama, such as Darwin's leaf-eared mouse. The less arid parts of the desert are inhabited by the South American gray fox and the viscacha (a relative of the chinchilla). 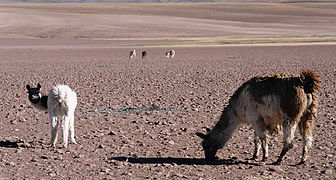 Larger animals, such as guanacos and vicuñas, graze in areas where grass grows, mainly because it is seasonally irrigated by melted snow. Vicuñas need to remain near a steady water supply, while guanacos can roam into more arid areas and survive longer without fresh water. Seals and sea lions often gather along the coast. The Atacama is sparsely populated, with most towns located along the Pacific coast. In interior areas, oases and some valleys have been populated for millennia and were the location of the most advanced pre-Columbian societies found in Chile. The Chinchorro culture developed in the Atacama Desert area from 7,000 to 1,500 BCE. These peoples were sedentary fishermen inhabiting mostly coastal areas. Their presence is found from today's towns of Ilo, in southern Peru, to Antofagasta in northern Chile. Presence of fresh water in the arid region on the coast facilitated human settlement in these areas. The Chinchorro were famous for their detailed mummification and funerary practices. In later times, the Atacama oases experienced little population growth and urban development. During the 20th century, they have had conflicts over water resources with the coastal cities and the mining industry. San Pedro de Atacama, at about 2,400 m (8,000 ft) elevation, is like many of the small towns. Before the Inca empire and prior to the arrival of the Spanish, the extremely arid interior was inhabited primarily by the Atacameño tribe. They are noted for building fortified towns called pucarás, one of which is located a few kilometers from San Pedro de Atacama. The town's church was built by the Spanish in 1577. The coastal cities originated in the 16th, 17th, and 18th centuries during the time of the Spanish Empire, when they emerged as shipping ports for silver produced in Potosí and other mining centers. During the 19th century, the desert came under control of Bolivia, Chile, and Peru. With the discovery of sodium nitrate deposits and as a result of unclear borders, the area soon became a zone of conflict and resulted in the War of the Pacific. Chile annexed most of the desert, and cities along the coast developed into international ports, hosting many Chilean workers who migrated there. With the guano and saltpeter booms of the 19th century, the population grew immensely, mostly as a result of immigration from central Chile. In the 20th century, the nitrate industry declined and at the same time, the largely male population of the desert became increasingly problematic for the Chilean state. Miners and mining companies came into conflict, and protests spread throughout the region. The desert has rich deposits of copper and other minerals and the world's largest natural supply of sodium nitrate (Chile saltpeter), which was mined on a large scale until the early 1940s. The Atacama border dispute over these resources between Chile and Bolivia began in the 19th century and resulted in the War of the Pacific. The desert is littered with about 170 abandoned nitrate (or "saltpeter") mining towns, almost all of which were shut down decades after the invention of synthetic nitrate in Germany in the first decade of the 20th century (see Haber process). The towns include Chacabuco, Humberstone, Santa Laura, Pedro de Valdivia, Puelma, María Elena, and Oficina Anita. The Atacama Desert is rich in metallic mineral resources such as copper, gold, silver and iron, as well as nonmetallic minerals including important deposits of boron, lithium, sodium nitrate, and potassium salts. The Salar de Atacama is where bischofite is extracted. These resources are exploited by various mining companies such as Codelco, Lomas Bayas, Mantos Blancos, and Soquimich. 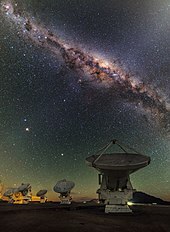 A new radio astronomy telescope, called the Atacama Large Millimeter Array, built by European countries, Japan, the United States, Canada, and Chile in the Llano de Chajnantor Observatory officially opened on 3 October 2011. A number of radio astronomy projects, such as the CBI, the ASTE and the ACT, among others, have been operating in the Chajnantor area since 1999. The Atacama Desert is popular with all-terrain sports enthusiasts. Various championships have taken place here, including the Lower Atacama Rally, Lower Chile Rally, Patagonia-Atacama Rally, and the latter Dakar Rally's editions. The rally was organized by the Amaury Sport Organisation and held in 2009, 2010, 2011, and 2012. The dunes of the desert are ideal rally races located in the outskirts of the city of Copiapó. The 2013 Dakar 15-Day Rally started on 5 January in Lima, Peru, through Chile, Argentina and back to Chile finishing in Santiago. Visitors also use the Atacama Desert sand dunes for sandboarding (Spanish: duna). A week-long foot race called the Atacama Crossing has the competitors cross the various landscapes of the Atacama. An event called Volcano Marathon takes place near the Lascar volcano in the Atacama Desert. Eighteen solar powered cars were displayed in front of the presidential palace (La Moneda) in Santiago in November 2012. The cars were then raced 1,300 km (810 mi) through the desert from 15–19 November 2012. Most people who go to tour the sites in the desert stay in the town of San Pedro de Atacama. The Atacama Desert is in the top three tourist locations in Chile. The specially commissioned ESO hotel is reserved for astronomers. About 80 geysers occur in a valley about 80 km from the town of San Pedro de Atacama. They are closer to the town of Chiu Chiu. The Baños de Puritama are rock pools which are 37 miles from the geysers. The asteroid 18725 Atacama has been named after the Atacama Desert. ^ Our Planet (9 November 2015). "Top 10 driest places on Earth". ^ a b Wright, John W., ed. (2006). The New York Times Almanac (2007 ed.). New York: Penguin Books. p. 456. ISBN 978-0-14-303820-7. ^ Rundel, P. W.; Villagra, P. E.; et al. (2007). "Arid and Semi-Arid Ecosystems". In Veblen, Thomas T.; Young, Kenneth R.; Orme, Anthony R. Physical Geography of South America. Oxford University Press. pp. 158–183. ^ Mckay, Christopher P. (2003). "Temperature and Moisture Conditions for Life in the Extreme Arid Region of the Atacama Desert: Four Years of Observations Including the El Niño of 1997–1998" (PDF). Astrobiology. 3 (2): 393–406. Bibcode:2003AsBio...3..393M. CiteSeerX 10.1.1.516.2293. doi:10.1089/153110703769016460. PMID 14577886. ^ a b Veblen, Thomas T., ed. (2007). The Physical Geography of South America. Oxford University Press. p. 160. ISBN 978-0-19-531341-3. ^ "Atacama desert". Terrestrial Ecoregions. World Wildlife Fund. Retrieved 11 March 2008. ^ Handwerk, Brian (23 October 2006). "Viking Mission May Have Missed Mars Life, Study Finds". National Geographic News. National Geographic Society. Retrieved 3 April 2013. ^ Minard, Anne (25 June 2007). "Giant Penguins Once Roamed Peru, Fossils Show". National Geographic News. National Geographic Society. Retrieved 3 April 2013. ^ Quezada, Jorge; Cerda, José Luis; Jensen, Arturo (2010). "Efectos de la tectónica y el clima en la configuración morfológica del relieve costero del norte de Chile". Andean Geology (in Spanish). 37 (1): 78–109. doi:10.4067/s0718-71062010000100004. Retrieved 5 December 2015. ^ Armijo, Rolando; Lacassin, Robin; Coudurier-Curveur, Aurélie; Carrizo, Daniel (2015). "Coupled tectonic evolution of Andean orogeny and global climate". Earth-Science Reviews. 143: 1–35. doi:10.1016/j.earscirev.2015.01.005. ^ Evenstar, Laura; Mather, Anna; Stuart, Finlay; Cooper, Frances; Sparks, Steve (May 2014). "Geomorphic surfaces and supergene enrichment in Northern Chile". Vienna: EGU General Assembly 2014, held 27 April - 2 May 2014. ^ "Snow Comes to the Atacama Desert". ESO. Retrieved 3 April 2013. ^ "Hyper-Arid Atacama Desert Hit By Snow". BBC News. 7 July 2011. Archived from the original on 8 July 2011. Retrieved 7 July 2011. ^ "Inundación en San Pedro de Atacama deja 800 afectados y 13 turistas evacuados". El Mostrador (in Spanish). 11 February 2012. Retrieved 3 December 2012. ^ "Tourism in San Pedro de Atacama restricted by floods". This is Chile. 15 February 2012. Retrieved 3 December 2012. 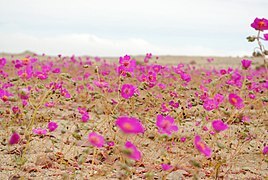 ^ a b "Atacama Desert Blooms Pink After Historic Rainfall (Photos)". LiveScience.com. ^ a b Erin Blakemore. "The World's Driest Desert Is in Breathtaking Bloom". Smithsonian. ^ "Yungay - the driest place in the world | Wondermondo". www.wondermondo.com. 3 November 2010. Retrieved 6 May 2017. ^ Boehm, Richard G.; Armstrong, David G.; Hunkins, Francis P.; Reinhartz, Dennis; Lobrecht, Merry (2005). The World and its People (Teacher's wraparound ed.). New York: Glencoe/McGraw-Hill. p. 276. ISBN 978-0-07-860977-0. ^ "The desert biome". University of California Museum of Paleontology. ^ "Rare snow in the Atacama Desert: Image of the Day". NASA. 13 July 2011. ^ Jonathan D. A. Clarke (2006). "Antiquity of aridity in the Chilean Atacama Desert" (PDF). Geomorphology. 73 (1–2): 101–114. Bibcode:2006Geomo..73..101C. doi:10.1016/j.geomorph.2005.06.008. Archived from the original (PDF) on 5 September 2015. ^ "Chile desert's super-dry history". BBC News. 8 December 2005. Retrieved 25 April 2010. ^ "A trip to Mars". www.eso.org. Retrieved 2 May 2017. ^ Navarro-Gonzalez, R. (7 November 2003). "Mars-Like Soils in the Atacama Desert, Chile, and the Dry Limit of Microbial Life". Science. 302 (5647): 1018–1021. Bibcode:2003Sci...302.1018N. doi:10.1126/science.1089143. PMID 14605363. ^ azua-bustos, A. (24 December 2014). "Discovery and microbial content of the driest site of the hyperarid Atacama Desert, Chile". Environmental Microbiology Reports. ^ Braudel, Fernand (1992). The Perspective of the World. Berkeley, Calif.: University of California Press. p. 388. ISBN 978-0-520-08116-1. ^ Thompson, Andrea (5 August 2008). "Scientists Set Record Straight on Martian Salt Find". Space.com. Retrieved 6 August 2008. ^ Wynne, J. J.; Cabrol, N. A.; Chong Diaz, G.; Grin, G. A.; Jhabvala, M. D.; Moersch, J. E.; Titus, T. N. Earth–Mars Cave Detection Program Phase 2 – 2008 Atacama Desert Expedition (PDF) (Report). Retrieved 3 April 2013. ^ Thos. Morong. (12 February 1891). "The Flora of the Desert of Atacama". Bulletin of the Torrey Botanical Club. 18 (2): 39–48. doi:10.2307/2475523. JSTOR 2475523. ^ Monique Bos. "Animals that live in the Atacama Desert". Paw Nation. ^ Claudio M. Escobar; et al. (March 2003). "Chemical Composition of Precloacal Secretions of Two Liolaemus fabiani Populations: Are They Different?". Diary of Chemical Ecology. 29 (3): 629–638. doi:10.1023/A:1022858919037. ^ Holsti, K.J. (1997). The State, War, and the State of War. Cambridge University Press. p. 151. ISBN 978-0-521-57790-8. ^ Clayton, Lawrence A. (1984). The Bolivarian Nations. The Forum Press. p. 26. ISBN 978-0-88273-603-7. ^ St. John, Robert Bruce (1994). The Bolivia-Chile-Peru dispute in the Atacama Desert (Report). International Boundaries Research Unit. ^ "War of the Pacific | South American history". Encyclopedia Britannica. Retrieved 27 September 2018. ^ "Exploring the Atacama". yes. Retrieved 3 December 2012. ^ Kogel, Jessica Elzea (2006). Kogel, Jessica Elzea; Trivedi, Nikhil; Barker, James; Krukowski, Stanley, eds. Industrial Minerals & Rocks: Commodities, Markets, and Uses (7th ed.). Littleton, Colo.: Society for Mining, Metallurgy, and Exploration. p. 605. ISBN 978-0-87335-233-8. ^ "ALMA Upgrade to Image the Event Horizons of Supermassive Black Holes". ESO Announcement. Retrieved 10 June 2014. 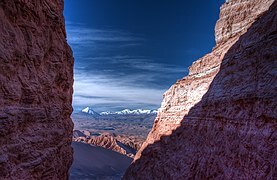 ^ "Top 10 Atacama Desert Facts That Every Tourist Must Know". Retrieved 19 November 2015. ^ Bustos, R.; Rubio, M.; et al. (2014). "Parque Astronómico de Atacama: An Ideal Site for Millimeter, Submillimeter, and Mid-Infrared Astronomy". Publications of the Astronomical Society of the Pacific. 126 (946): 1126. arXiv:1410.2451. Bibcode:2014PASP..126.1126B. doi:10.1086/679330. ^ Toll, Rosser (3 October 2011). "In Chile desert, huge telescope begins galaxy probe". AFP. Retrieved 3 October 2011. ^ "Ruíz-Tagle ve difícil que Chile no esté en un nuevo Dakar". La Nacion. 21 November 2012. Retrieved 3 December 2012. ^ "Dakar Rally event 2013 to culminate in Chilean capital". yes. This is Chile. 26 March 2012. Retrieved 3 December 2012. ^ "Atacama Crossing". yes. 4 deserts. Retrieved 3 December 2012. ^ Volcano Marathon Volcanomarathon.com. Retrieved 18 November 2015. ^ "Nueva generación de autos solares son presentados en Chile". La Nacion. 7 November 2012. Retrieved 3 December 2012. ^ "Los autos que competirán en la súper carrera solar de Atacama". La Nacion. 8 November 2012. Retrieved 3 December 2012. ^ "Guide to Atacama Desert". Conde Nast Traveller. Conde Nast. Retrieved 3 April 2013. ^ Vickers, Graham (2005). 21st Century Hotel. London: Laurence King. p. 122. ISBN 978-1-85669-401-8. ^ Erfurt-Cooper, Patricia; Cooper, Malcolm, eds. (2010). Volcano and Geothermal Tourism: Sustainable Geo-resources for Leisure and Recreation. London: Earthscan. ISBN 978-1-84407-870-7. ^ Mroue, Haas; Schreck, Kristina; Luongo, Michael (2005). Frommer's Argentina & Chile (3rd ed.). Hoboken, N.J. [u.a. ]: Wiley. p. 308. ISBN 978-0-7645-8439-8. Braudel, Fernand (1984) . The perspective of the world. Civilization and Capitalism. 3. Berkeley: University of California Press. ISBN 978-0-520-08116-1. OCLC 505033669. Sagaris, Lake (2000). Bone and dream: into the world's driest desert. Toronto: Alfred A. Knopf Canada. ISBN 978-0-676-97223-8. OCLC 57692400.